Carolina Sporting Arms is home to a premiere 5-star indoor shooting range and retail store. We cater to shooters of all experience levels who are looking to shoot/purchase pistols, rifles, shotguns and various shooting accessories. You can also stop by to participate in several of the basic firearms training classes offered by CSA under the supervision of NRA certified, highly-trained professionals, all within a clean, safe and welcoming environment. CSA is located just south of uptown Charlotte on South Boulevard. The ‘first steps’ training class offered by CSA places emphasis on receiving basic firearms training, specifically when it comes to learning what it takes to defend yourself with a handgun. This beginner level course is an all classroom lecture style class, aimed at teaching the basic fundamentals of how to safely handle and operate all of the features of a firearm, educating students on the legal aspects of owning a firearm and provides students with hands on experience in regard to how they can safely and effectively operate a firearm. The ‘first shots’ class offered by CSA is the second step for beginner level shooters who are looking to further their knowledge in regard to basic firearms training. Unlike the ‘first steps’ course, the ‘first shots’ course includes live fire training which will create a base of confidence in how to safely and effectively operate a firearm among each class participant. This particular course requires an unloaded handgun with magazines, at least 50 rounds of ammunition, eye protection and ear protection. The Ladies Night shooting event at CSA is a female exclusive event held on the last Wednesday of each month that is open to all women of all levels of shooting experience. The entirety of this class takes place on the range, where shooters will be able to shoot various handguns they have been wanting to try (ammo included). They can also gain more knowledge in regard to firearms, ask any questions about concealed carry, different guns or gun issues related to women, or just enjoy a night out at the shooting range with like-minded women who have taken the initiative to prioritize how to effectively defend themselves! Ladies Night includes free eye/ear protection to keep (a $10 in store credit will be granted to those who already received free eye and ear protection in the ‘Give it a Shot’ class), one shooting target, one hour of range time, a select variety of guns to shoot (ammo included) and the presence of an instructor who will be more than happy to answer any questions. At the conclusion of the range portion of Ladies Night, the group of women will convene in the lounge to spend time socializing with fellow shooters and their instructor. It is here where handguns for concealed carry and the gun of best fit for each shooter will be discussed among the group. 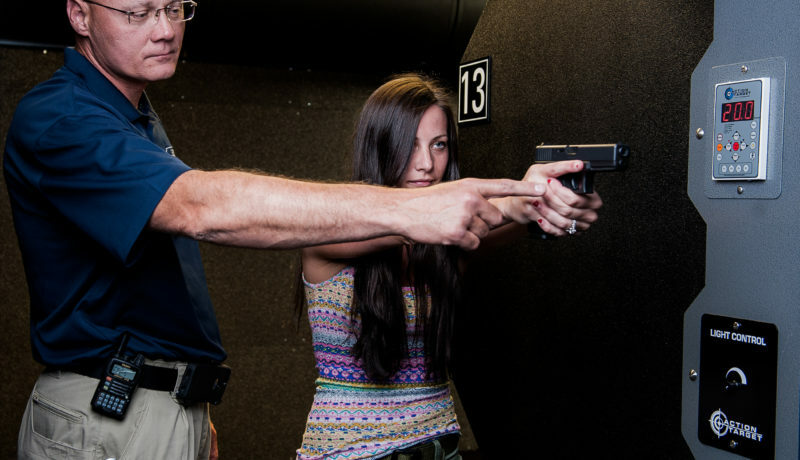 The various stages of the basic firearms training courses offered at Carolina Sporting Arms is intended for new shooters and new female shooters who are looking to explore how to utilize handguns in a safe and responsible manner. Carolina Sporting Arms wants to emphasize that the classes offered at their facility are controlled in an extremely safe, monitored and relaxed environment, catered towards shooters who may be timid when it comes time to experience their first shooting experience. Safety has and always will be the top priority at Carolina Sporting Arms. Now that the various courses of basic firearms training have been broken down to what each course offers, we hope that you will come out and enjoy the expertise, product quality and state of the art amenities offered at Carolina Sporting Arms.